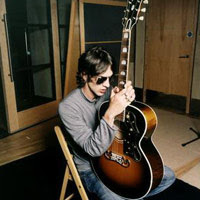 The Verve's ex-frontman Richard Ashcroft is getting ready to release his first solo album, "Alone With Everybody," on Virgin Records on June 27, and in the meantime he's been getting a crash course in parenting a newborn. Ashcroft and wife Kate Radley, the former Spiritualized keyboardist who also plays on her husband's new record, gave birth to a boy named Sonny on March 23 (see "Ex-Verve Frontman Richard Ashcroft Fathers Son"). Despite the hectic promotional schedule for his new solo album, Ashcroft told MTV News that he has managed to fit some sleep into his schedule in between changing diapers and minding Sonny. "As soon as Sonny arrived, I was fast asleep by 10:00 p.m. I don't know whether it was such an emotional experience that I needed to sleep or something, but the tables have been shifted. Now I find myself, like I said, fast asleep at 9:00 or 10:00, so I'm gonna have to do something about that. "But it was an incredible experience," he said, "and continues to be, on a daily basis, an affirmation of life from the moment I wake up, which is an incredible feeling." Ashcroft also mentioned that the completion of his "Alone With Everybody" album came at almost the exact same time as Sonny's birth. "It was almost a race at one point," he said. "It was very strange, racing to see if we could get the album done in time, and I think we sort of said we finished it two days before he arrived, and I think we had to do one recall on a track after he was born. "So it was a very closely run thing, and something that was obviously in the back of my mind all the way through the recording of the album, pretty much. [Particularly] the last seven or eight months of it, anyway." "A Song For The Lovers," a track Ashcroft said was inspired, in part, by the Joy Division classic "Love Will Tear Us Apart," is the first single from "Alone With Everybody," and Ashcroft has already lined up "Money To Burn" as the second single from the record.